The happenstance nature of all this is carefully orchestrated. Sometimes Kelman’s carefulness shows through, a visible seam holding the plot together, but he compensates for this with the wonderfully observed slow accumulation of detail that makes up Murdo’s world — both inner and outer ... It takes discipline for a writer to stick to the commonplace so religiously, but over time that discipline pays off. The ordinary becomes the real, and as Murdo sets off to find that gig in Lafayette the casual descriptions of his journey become almost breathlessly anxiety-producing. There’s an element of wish fulfillment here that’s unusual in Kelman’s work, but he’s paid for it, as it were, in advance. And the novel’s ending is more than justified by Kelman’s means of getting us there. A kid is trying to overcome his grief without forgetting about it: a contradiction that serves more generally for what’s involved in being an immigrant, or in growing up. And Dirt Road is about all of those things. Modernist stream of consciousness lives on in the brilliant Dirt Road ... Like a 21st-century, Scottish, working-class, Leopold Bloomian Holden Caulfield, 16-year-old Murdo Macdonald ruminates on boats, sounds, birds, insects, cells, girls, music, work, race, life, and death in a narrative as epic as it is quotidian, an adolescent Hero’s Journey through grief and America ... Through Murdo’s eyes, contemporary America — 'A different world. That was America. Ye thought ye knew it from the movies but ye didnt' — appears defamiliarized yet spot on: our sidewalk-less suburbs and seedy bus stations; convenience-store food and mall walking; weather obsession, security state, guns, and racism. But if both Kelman, a lifelong radical, and his teenage protagonist are skeptical of our politics (the Scottish gathering is threaded with white supremacy), they embrace our music as a powerful unifying force, transcending and bringing together races and cultures. Murdo can never escape the loss of his sister and mother; he can only assuage them. One facet of Dirt Road’s genius is that it recognizes this, offering neither pat catharsis nor improbably definitive resolution. Yet Murdo and his father both move forward in a final move that is unexpected, if a bit fantastic, but perfectly in line with this beautiful novel. Like the great protagonists of Russian fiction, Kelman’s characters, no matter how little money or formal education they possess, are lit up by their own sensibilities and 'soul.' Dirt Road is steeped in this tradition ... 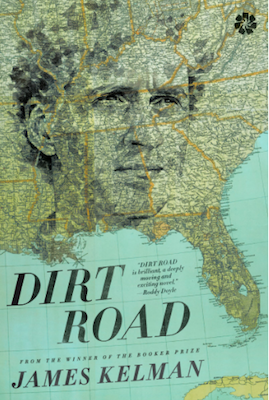 Dirt Road is not only a novel about a boy’s journey through music away from the paralysis of grief, it is also about race. With ease, Kelman’s narrative moves away from his previous settings in Scotland and England and focuses on the realities of a country in which the divisions between black and white are livid and dangerous ... In Dirt Road we see him continuing to show how human experience can be energised and renewed by its modest scale, not flattened by it into a stereotype. It is another masterpiece from one of our best writers. What did you think of Dirt Road?